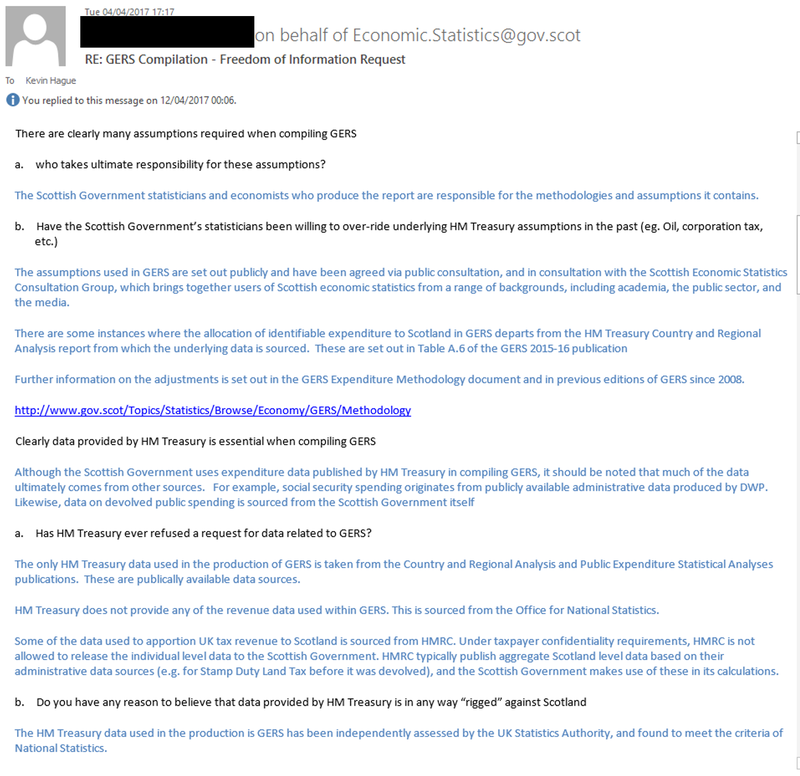 Well, I appear to have caused quite a stir by understanding and defending the historical economic data compiled and published by the Scottish Government. Who would have thought that doing such a thing would be so controversial? My Twitter timeline has been over-loaded with notifications (of both abusive and supportive mentions) and I'm even told I was briefly a "trending topic". Go me. An SNP MP has been quoting me as having "conceded" something I've consistently been very clear about, the cybernats have created a meme about me and others have created counter-memes1. 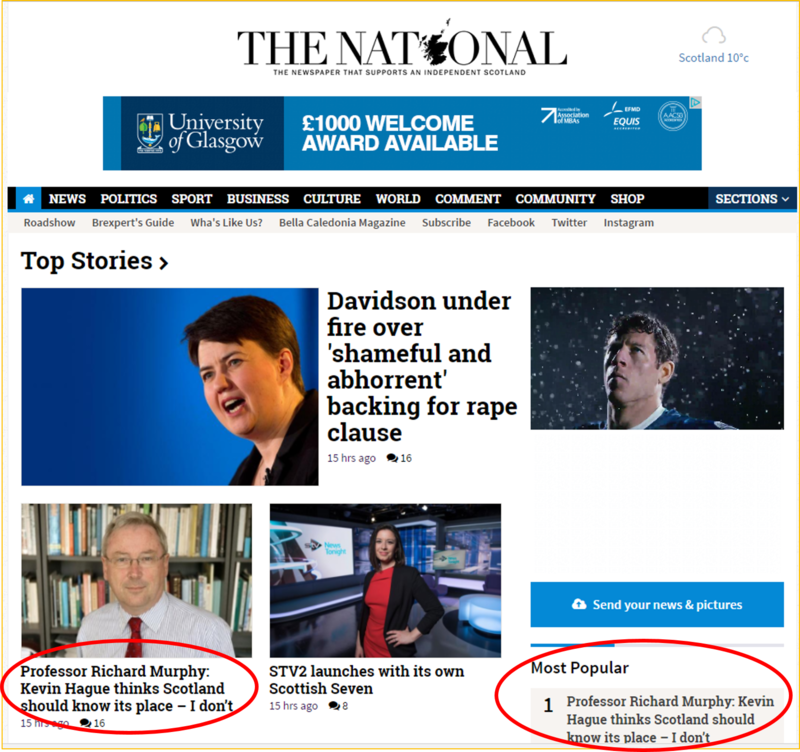 Now I even see an article ostensibly about my views [Kevin Hague thinks Scotland should know its place ...] is currently the National's "most popular2". I know not many people read the National3, but it's not every day you find yourself in the eye of the storm, even if it is just one in a tea-cup. The cause of all this is a spat (first online, then on radio, now in print) between a Professor Richard Murphy and me about the trustworthiness of the Scottish Government's GERS figures (GERS being the report which, quite explicitly, "estimates the contribution of revenue raised in Scotland towards the goods and services provided for the benefit of Scottish residents under the current constitutional arrangements"). I recommend you listen to the radio debate if you have time (it's about 20 minutes long): John Beattie Show. Last August, the National published an article co-authored by Ian Dommett, former Marketing Director of Yes Scotland, headlined "11 lessons the Yes campaign must learn to win a second referendum". Tacitly accepting that the economic case for independence lies in tatters, it resorted to appealing for people to discredit the Scottish Government's own figures. As the months passed, it seemed nobody with even the thinnest veneer of credibility would respond to this clarion call. Then, just a few weeks ago, a Professor Murphy entered the Scottish Independence debate. His contribution was to assert that the National Statistics published by our Scottish government are nonsense, that we practically know nothing about the Scottish economy and that what figures exist can't be trusted and are probably rigged by Westminster. Having since discovered he hadn't understood the methodologies and assumptions used (and that these are chosen by the Scottish Government themselves) Murphy seems to have backed down, now saying he's merely suggesting that the accuracy of the data could be improved. That he has implicitly retracted some of his more swivel-eyed claims is a good thing. That the GERS-denying wing of the pro-independence movement will ensure his initial wildly inaccurate and ill-informed assertions will echo on social media for years to come is as predictable as it is depressing. His apparently more measured calls for better data still make little sense. In fact he's merely exposed the fact that he doesn't understand the nature of data we do have and appears ignorant of the law of diminishing returns. The issue is not that we're not allowed access to data, it's that the data he thinks we need isn't currently gathered. To address this, he appears to champion introducing intra-UK border posts so that we can have more accurate import/export data. He implies that companies should face a four-fold increase in their reporting burden by forcing them to file separate profit and loss accounts and VAT returns for each devolved UK region they trade in. Better data comes at a cost, a cost which would damage our economy but wouldn't materially change the debate about an independent Scotland's economic challenges. The financial uncertainties we have to deal with when considering the possibility of independence are measured in billions. The oil forecasts used in the White Paper were out by £6.8 - 7.9bn. We have no idea what currency we'd be using and how that would be supported. Battling to improve the accuracy of historic figures by a £100m here or there would be a pointless exercise given the latest GERS deficit is a whopping £14.8bn. Focusing on improving the GERS data is less like rearranging the deck chairs on the Titanic, more like hearing the Titanic is heading towards an ice-berg at 15 knots and complaining that we actually only know that the speed is somewhere between 14.5 and15.5 knots - and arguing that simply isn't good enough information on which to act. It gets worse. Just in the last week Murphy showed his own hypocrisy by applauding analysis using the same data sources which showed - before taking our public spending into account - that Scotland "is doing just fine" as a UK region. 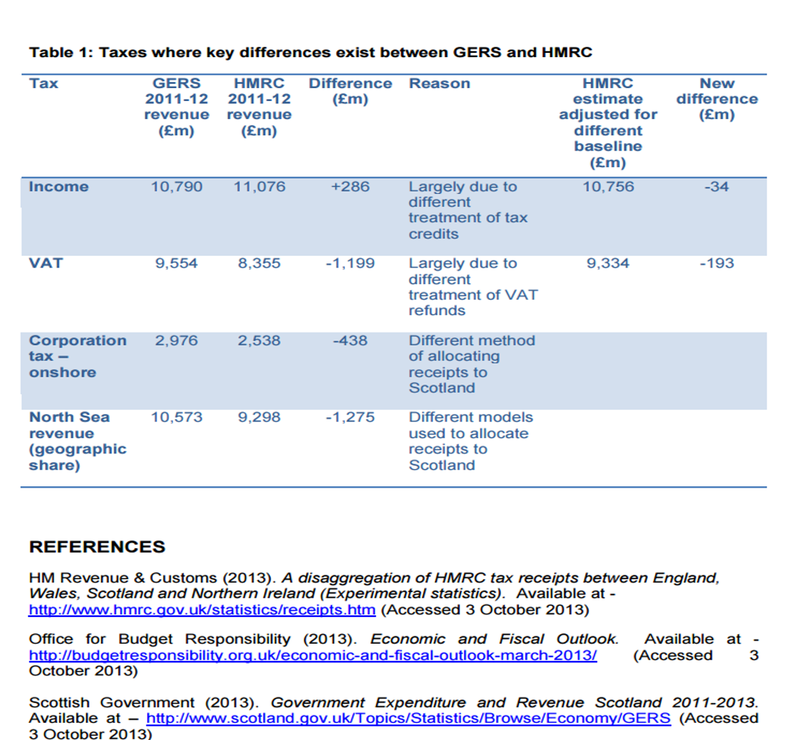 This reinforces a point many of us have been making for years, namely that the issue with Scotland's economy is less on the revenue generating side and more on the spending side: GERS shows the Scottish onshore economy consistently raises only £400/capita less in taxes than the rest of the UK, but that we spend an eye-watering £1,300/capita more4. It's telling that Murphy avoids engaging on the spending side of the GERS figures, despite this being the biggest issue GERS reveals. That's probably because the £1,300/capita higher spend is not based on estimates or surveys or per capita allocations of shared costs: it's nearly all explained by the Scottish Government's own budget and by actual welfare and pensions data from the DWP. 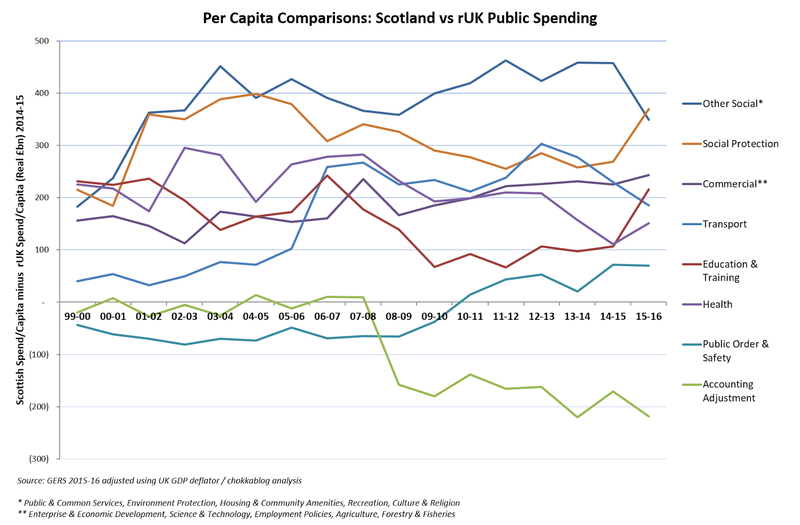 Nobody with any credibility denies that Scotland simply spends far more per capita on public services than the rest of the UK. 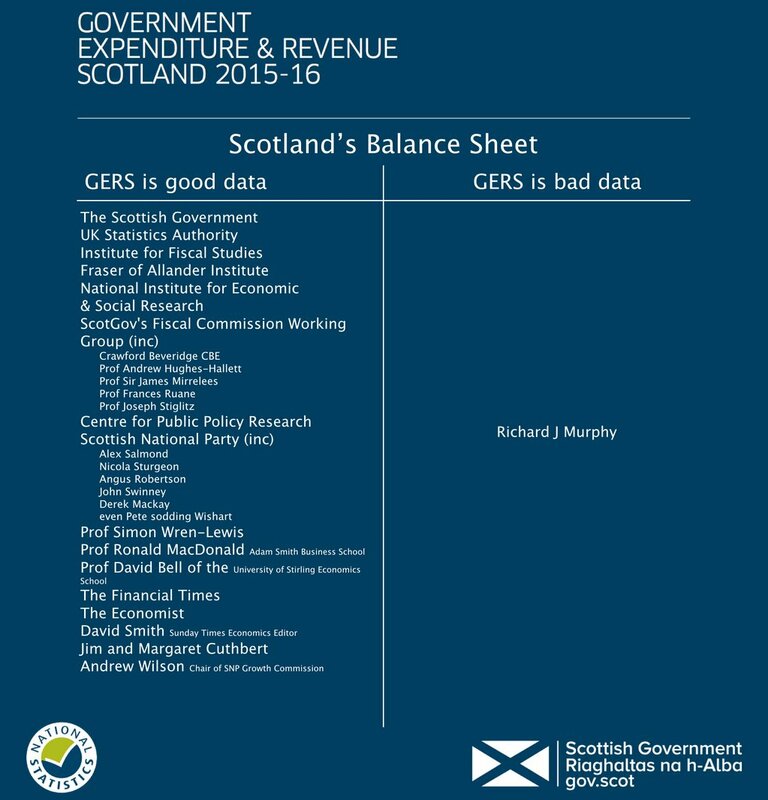 So to conclude: GERS data shows - to an acceptable degree of accuracy - that the tax revenues our Scottish economy currently generates are insufficient to sustain the level of public spending we are currently used to receiving. Many pro-independence campaigners rightly recognise this and are trying to find ways to credibly address the challenge. Denying the validity of the GERS data, as Murphy has attempted to do, is simply not a credible stance to adopt. Let's unpick this by starting with Richard Murphy's latest slight strange article in the National. 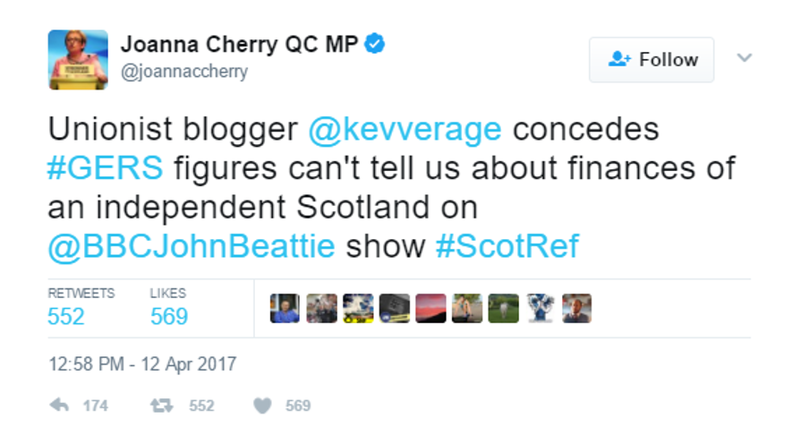 His article starts by saying ..
"LESS than a month ago, I admit I had not heard of the political commentator Kevin Hague [...] Then I wrote a blog explaining why, in my opinion, that data was unsuitable for decision-making in Scotland". 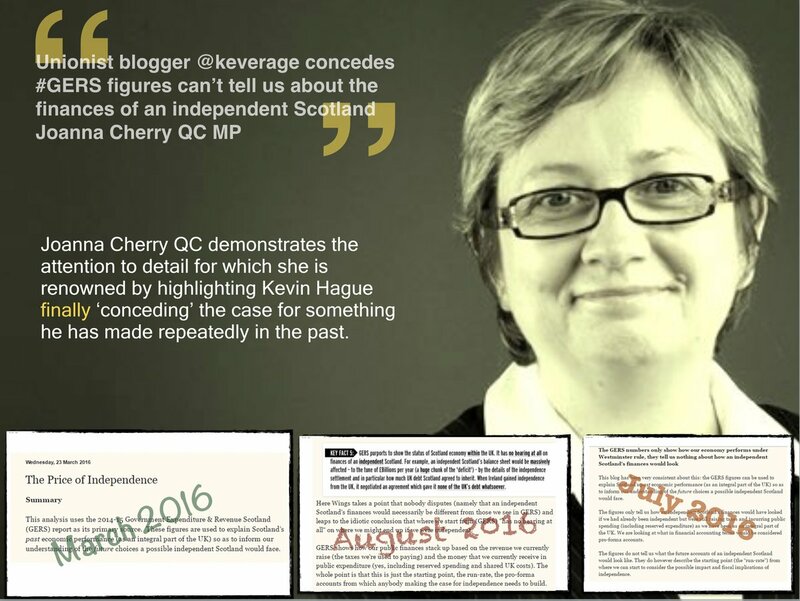 "If only Kevin Hague realised that all change for the better is dependent upon someone, somewhere sticking their head above the parapet and saying that things aren’t good enough and could be improved, he’d have something much more useful to say. I’m happy to play that role of the person seeking change in this case"
So he's positioning himself as somebody who's merely said the data is "unsuitable for decision making" and "could be improved". He is now, apparently, merely an agent of change. This is a climb-down to rival that achieved by Sir Edmund Hillary and Sherpa Tenzing after they'd conquered Everest. Twitter, 13th March: "Three numbers Scots should not trust: Scottish GDP, tax take and total government spending. All easily rigged by Westminster"
"forget Scottish GDP data: we just don’t know what it is"
"Westminster could pretty much manipulate this data at will [..] the last thing [the SNP] should do is trust that from London"
"But there is no data ..."
"based on estimates provided from what I called London, which was a euphemism for the whole Westminster controlled machinery of government"
I could go on, but I think you get the picture by now. For those who care, I carefully corrected his more obvious misunderstandings in my blog at the time: Richard Murphy: GERS denier. There was also an excellent blog from the University of Stratchlyde's Fraser of Allander Institute which made similar points, albeit using more diplomatic language. Suffice to say that he strongly implied the data was "rigged" and "manipulated" by Westminster. He wrongly (and ridiculously) asserted that because some estimates are used, there is actually "no data" and that what data there is is "nonsense" (and comes from London so can't be trusted anyway). This is full-on fact-denial, and has rightly been treated with disdain by respected economists5. Here's how the ONS describe themselves: "We are independent of ministers and instead report through the UK Statistics Authority to Parliament and the devolved administrations of Scotland, Wales and Northern Ireland." I'm sure Richard would point out it's naive to believe they're independent just because they're constituted to be so. It's clear he doesn't trust the ONS. Or does he? I was amused to notice that just in the last week he was applauding analysis by Robin McAlpine of the Common Weal, saying: "What he quite effectively showed – using ONS and House of Commons data – was that Scotland is doing just fine as a UK region [..] I endorse [..] the analysis". I haven't checked the analysis, but at least in terms of economic activity as measured by GVA6 (i.e. 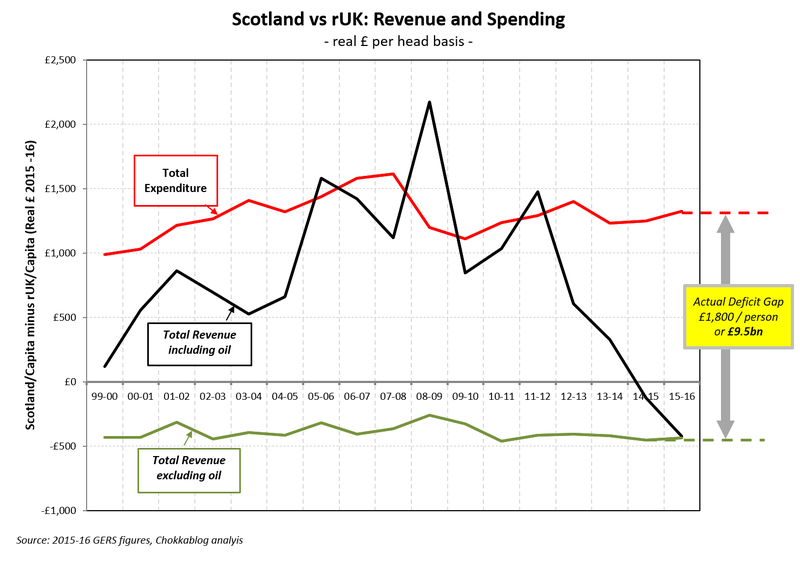 the revenue generation side of the equation, before we consider spending) I agree "Scotland is doing just fine". 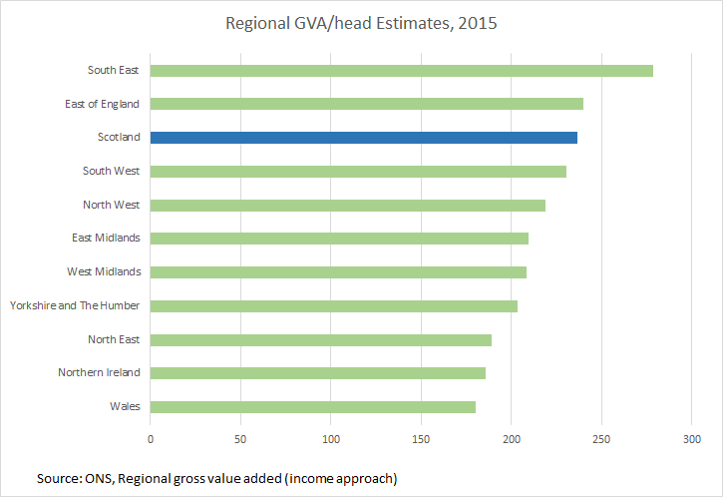 I have consistently pointed out that the revenue generation of our onshore economy in Scotland is broadly in line with the rest of the UK. 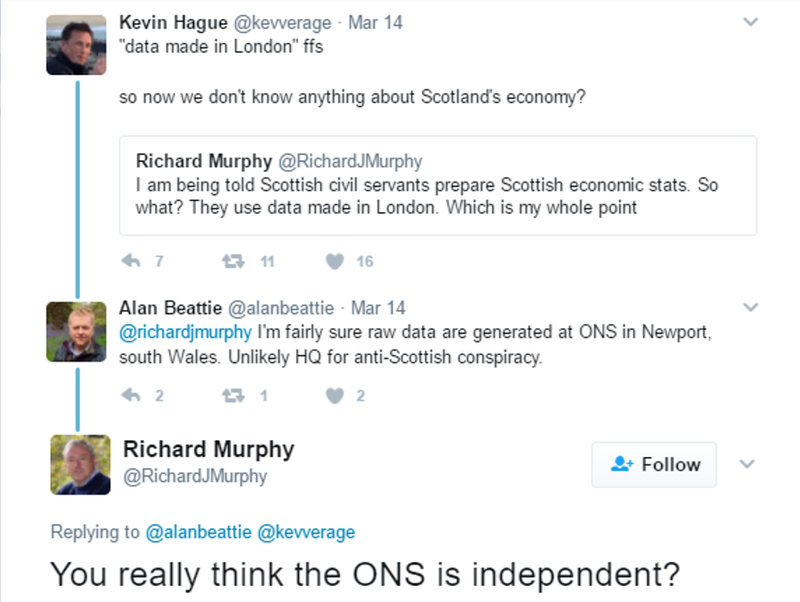 But then I do trust ONS data - it seems Richard only trusts it when he likes the answer. "The chance that Scotland makes a deficit of the scale it suggests is remote. It is exceptionally unlikely that eight per cent of the population make 17 per cent of the UK deficit"
This is a genuinely extraordinary statement - he either doesn't understand maths or thinks the readers of the National are dribbling fools. What is exceptionally unlikely is that the Scottish Government would consistently make the mistake of over-stating our share of the UK's deficit. To illustrate: imagine a retailer has two stores, one large store with many employees and one small store with fewer. Both stores make similar sales per employee, but the small one pays its staff slightly more*. The big store is break-even, the smaller store loses money. The smaller store would therefore be responsible for 100% of the retailer's losses. There's nothing "exceptionally unlikely" about that. Now if 8% of the population was responsible for 17% of our revenue or 17% of our public spending, that might be surprising - but that's not the case. *This analogy is not a bad one: Scotland and the rest of the UK generate similar revenue per capita (sales/employee) but Scotland has higher public spending per capita (cost per employee). "it would be England that would owe Scotland money if there was independence"
Heaven knows I've heard some bizarre assertions during Scottish Independence debates, but this one's a doozy. It is of course offered with no justification - it seems Richard just feels like it should be the case. Incredible. "[the economic debate could be improved] if GERS and all the nonsense that goes with it is dismissed as another example of Westminster’s contemptible attitude to all things Scottish"
It seems Richard still hadn't grasped that GERS has nothing to do with "Westminster's attitude" to anything, because it's the sole responsibility of the devolved Scottish Government. The most charitable interpretation I can offer is that Richard waded in without doing his homework. Like a late arrival to a bar-room brawl, he charged in swinging blindly and didn't realise he was actually punching the Scottish Government's own economists and statisticians. In the face. Repeatedly. Let's be charitable: as someone who is new to this debate8 he's had a lot of catching up to do; we should maybe allow him to re-position himself from full-on "GERS denier" to someone who merely argues that the data "could be improved". So let's continue by just looking at what he's now saying in his latest National column. He makes three points. His first and second points are basically that GERS used to be fine but "times have changed" so it needs to be improved, we need better data. This ignores the fact that GERS is already being continually improved. The 12 civil servants and the 16 external members who sit on the Scottish Economic Statistics Consultancy Group (SESCG) - including those independent consultants beloved by the Nationalists, Jim and Margaret Cuthbert - will I'm sure be very keen to hear some detail from Professor Murphy as to what they're missing. The SESCG is meeting again later this month: who wants to run a book on the likelihood of Professor Murphy making the effort to be there? Will he have constructive suggestions to make to back up his bellicose rhetoric? It's clear that Murphy has little or no idea of the amount of work that goes into continually revising and improving the GERS methodology. If he did he might bit a bit less cavalier with his insults towards the full-time dedicated team of Scottish Government economists and statisticians who compile them. Let's be clear about one thing: as various Freedom of Information requests7,9 have confirmed, no data is "denied" Scotland by Westminster. 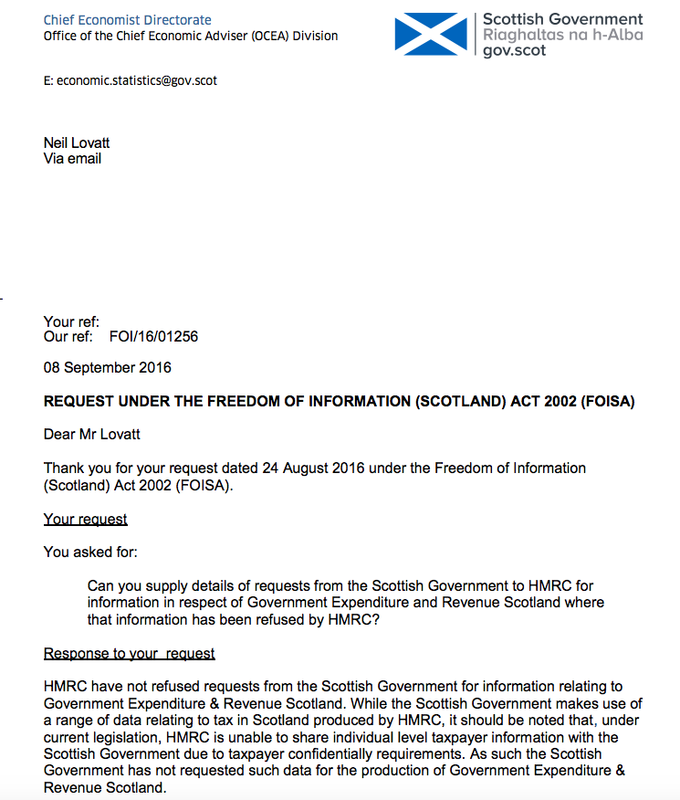 The issue - as argued cogently by Neil Lovat on his blog here - is whether it is worth incurring the expense and disruption of gathering additional information to make the GERS figures more accurate. "Are GERS estimates perfect? No. Significant uncertainties exist around them. Anyone who treats GERS figures as sacrosanct to 10 decimal places can safely be disregarded with your preferred euphemism for idiot. But substantial changes to how they are collected have already taken place. The methodology was substantially interrogated in 2007 after the SNP came to office: nearly every revenue estimate was revised. [..] The real question is what an independent Scotland would do with its economy. 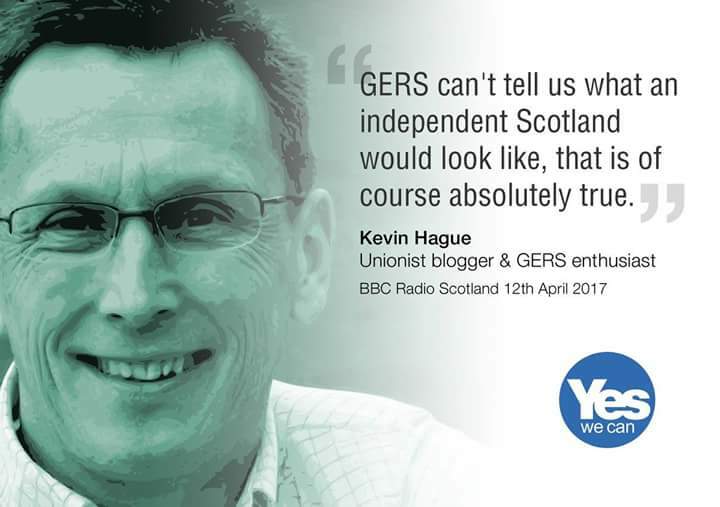 GERS represents, with some imperfection, Scotland-in-the-UK, not an independent Scotland. But Scotland-in-the-UK is the starting point for the journey." But back to Murphy. He certainly hasn't made any practical suggestions as to how GERS should be improved, but he has given some examples where he thinks the data isn't good enough, so let's look at those. In his first blog on this topic, one of his many goofs was to assert that "no one has a clue what crosses the borders from Scotland to England and Northern Ireland". As I pointed out at the time, Richard clearly hadn't looked at Export Statistics Scotland (ESS), which is where that information comes from. 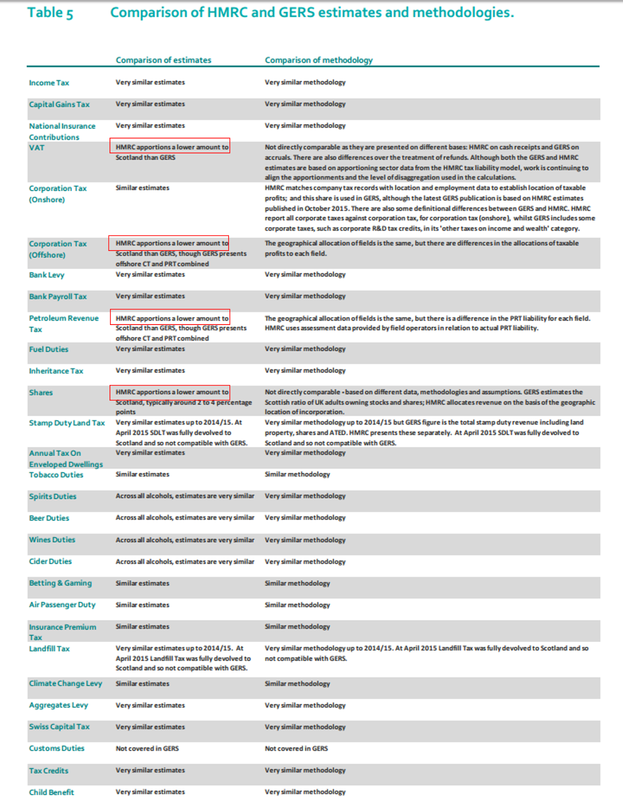 This is data compiled by the Scottish Government, primarily using the Global Connections Survey run by the Scottish Government. Like so many economic statistics, it's an estimate - but one triangulated with other sources and which qualifies for National Statistics designation. "It’s the same with imports and exports: no-one knows what these are because there are no border posts at Carlisle, Berwick-on-Tweed or Stranraer." Interesting huh? He's not suggesting something practical (like, say, that the survey needs to be more widely completed by putting greater pressure on more businesses to complete it). No, he explains that no-one knows because there are no intra-UK border posts. The implication is clear: to satisfy his desire for better data we need to put border posts up between Scotland and England. It's a ludicrous suggestion - and of course the data still wouldn't be perfect, not least because most of our rUK exports are services. He also complains that "Revenue Scotland is still struggling to work out which people are tax resident in Scotland". There will be some issues at the margin here for sure (issues that would exist even if Scotland were independent), but the materiality of this problem might be contested by the 300,000 Scots who are affected by the lower higher-rate taxation threshold in Scotland. HMRC seems to be finding us without too much difficulty. He also moans that the Scottish Government "has no clue at all on what corporation tax, VAT [raised in Scotland actually is]" . If the GERS figures have any bias, it's likely be in Scotland's favour. With VAT and other consumption taxes, the current methodology rather neatly uses consumer spending data to attribute these to Scotland. On this basis it's worth noting that Scotland gets attributed more per capita income than the rest of the UK for VAT as well as tobacco, alcohol and gambling duties12 - so the GERS figures benefit from this approach compared to crude per-capita allocations. What is Richard's proposed better methodology? Again his article gives us the answer - we don't know the right figures "because no-one has to declare those taxes separately for Scotland". It's clear Prof Murphy is an academic and not a real-world businessman. He seem to think that imposing additional reporting burdens on UK businesses would be a worthwhile price to pay to tighten the accuracy of the GERS data. Is he seriously suggesting we get all businesses that trade UK-wide to file four VAT returns every quarter, one for each devolved UK region? Does he want to enforce the (frankly meaningless) burden of regional profit reporting in audited accounts? Corporation Tax is a special case worthy of an aside. The only way we could get better data here would be by forcing companies to report profit for each area of the UK in which they trade. This would not only be an onerous task but a spectacularly pointless one. If Scotland were to become independent, many things would change (not least, depending on corporation tax rates, where companies would choose to base themselves and report their profits). Nobody can know which jurisdiction companies would choose to report their profits in were Scotland to become independent. We can't make the historical data meaningfully "more accurate" if what we want to know is what would an independent Scotland's corporation tax take be - there are so many variables the best we can do is allocate UK corporation tax based on economic activity levels. Which is precisely what GERS does. Standard statistical analysis tells us that the survey based revenue allocations in GERS are accurate to +/-£0.6bn13. Is it really worthwhile to introduce more administrative costs and tie businesses up with the burden of four-fold additional reporting requirements to improve accuracy further? In a word: no. The White Paper oil forecasts were out by £6.8 - 7.9bn. What's the point in mithering about a hundred million here or there in our historical actual figures when the forecast uncertainties are measured in billions? "in the last couple of weeks the UK Office for National Statistics has said data of the sort I have suggested, based on real tax income, should now be used for UK-wide decision-making. So why should that not be the case in Scotland as well, I argued." "statisticians have found that the forecasting techniques used for the initial GDP estimates — which are published one month after the end of each quarter — “struggle to pick up turning points” when the economy lurches downwards or up. [..] VAT data will increasingly be used as the primary source of initial estimates of the size and growth of the economy"
It's very clear that the issue here relates to data used for initial estimates, not the data used for the actual figures (which are published later). It's frankly pretty desperate for Muprhy to suggest this somehow vindicates his position. So we've covered what he's said, but the astute reader will maybe have noticed that all of this recent talk has been about revenue allocations in GERS and there's nothing being said about cost. During our radio debate [listen here] he asserted that when it came to decisions about how we spend in Scotland "the variations are relatively small". I wasn't given a chance to respond to that statement, but it's absolute nonsense. 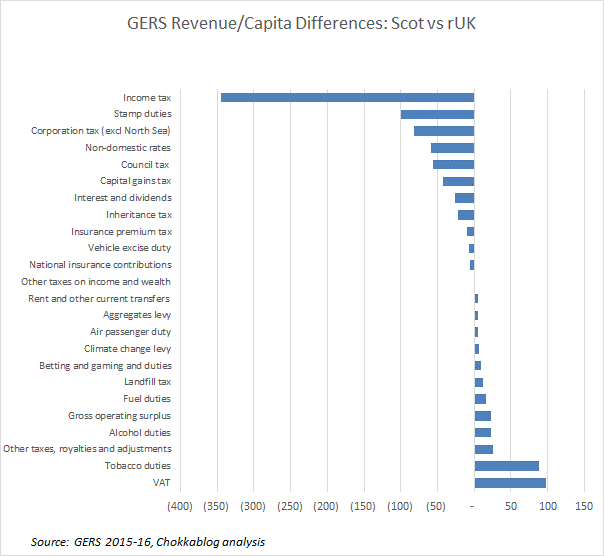 GERS shows that Scotland overall spends £1,324 more per capita than the rest of the UK. The one thing we can be absolutely sure of is this has nothing to do with Defence, Debt Interest and International Affairs costs which are allocated on a per capita basis (because the per capita difference in these cases will necessarily be zero, obviously). In fact this higher spend is almost all accounted for by Scotland's own devolved budget areas (health, education, etc.) or by non-devolved social protection spend (primarily pensions) where the information comes directly from the DWP (and is known, not estimated). I was amused that in the radio debate Murphy suggested that those DWP costs are "dumped" on Scotland - that's an extraordinary way to describe pensions and other welfare payments. This higher per capita spending in pretty much every public service area has been consistently true for years14. Let me finish by recalling how the radio debate concluded [listen here]. 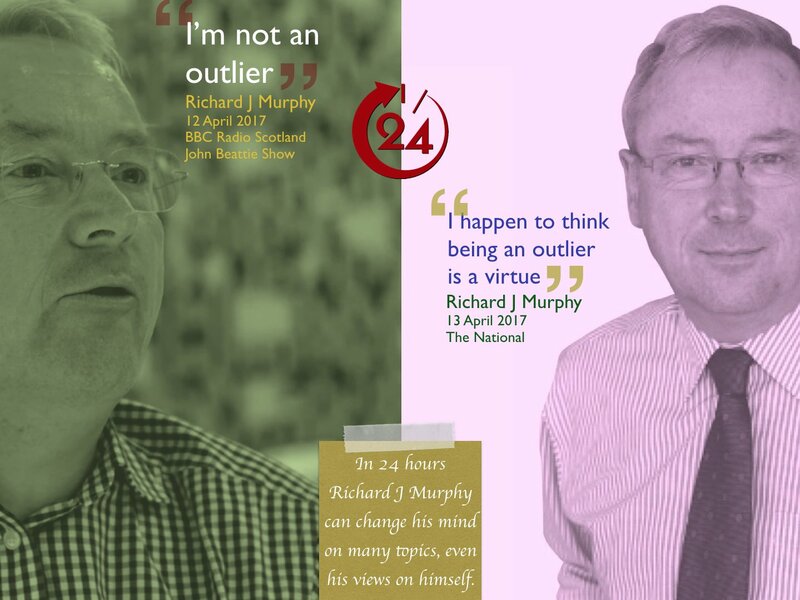 When the presenter/moderator John Beattie suggested that there's a problem if half the country don't believe GERS is good data, I pointed out this wasn't the case, that Richard was in fact very much an outlier. At the time Richard responded "oh come off it [...] I'm not an outlier." You will perhaps forgive me, therefore, if I allowed myself a small chuckle when I read in his latest National column that he now embraces that term (as I suggested he would): "I happen to think being an outlier is a virtue, not a failing". "It is important to note that that GERS is a national Statistics publication and assessed by the independent UK Statistics Authority. The statistics are produced by civil servants, and not by a partisan group, and are best practice in the sense that they meet the Code of Practice for Official Statistics, a code that is consistent with the European Statistics Code of Practice. As in practically any statistical exercise the GERS statistics depend on estimates and there is nothing unusual about that. In that regard it is noteworthy that the statistics produced and reported in GERS come with standard confidence intervals indicating the uncertainty with which the central estimates are held. An examination of these confidence bounds demonstrates that the generally accepted position on Scotland’s fiscal and trade positions are unchanged. This is why mainstream economists, statisticians and commentators will continue to use these statistics in their work." "These are the sorts of questions we should be debating. Questioning the integrity and robustness of National Statistics is not one of them. "